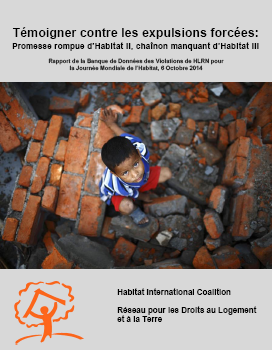 Habitat International Coalition (HIC) is an international collective of civil society organizations, social movements and individuals that mobilizes and advocates, defends and promotes the full implementation and enforceability of the human rights of homeless, evicted, displaced, landless and inadequately housed people and communities, including those under occupation, in urban and rural areas. HIC seeks to empower Members and communities to improve their conditions through four areas of competence: human rights, gender equality, social production and environmental sustainability. 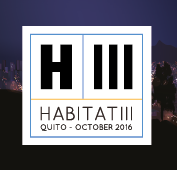 HIC produces knowledge and promotes public awareness about habitat issues and serves as a platform for the formulation of programs, policies and strategies for constituent social movements and civil society organizations working to operationalize the human rights to housing, land, and the city, and acts as their representative to public, regional and international bodies and forums. Visit www.hic-gs.org for more information. The Housing and Land Rights Network (HLRN) and its specialized HIC Members function within HIC is to develop, mainstream and integrate competence in human rights analysis and methodology among HIC Members and similarly specialized alliances through a program of networking, knowledge-creation, capacity-building and advocacy activities, especially in cooperation with the UN Human Rights System. The HIC-HLRN Program and mission advocate the recognition, defense and full implementation of the human right to adequate housing as a secure place to live in peace and dignity, as well as equitable land use and access as a human right for everyone, everywhere. In so doing, HIC-HLRN develops and implements monitoring tools, builds Member capacity and publishes on housing and land rights conditions and violations globally, as well as through regional programs in Middle East/North Africa and South Asia. HIC-HLRN is under registration in Egypt. 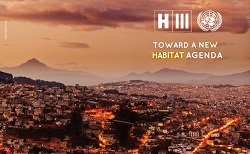 As Program Officer for Habitat International Coalition-Housing and Land Rights Network you will work to support general program functions and Member services, organization development and fundraising, and engage with international processes relevant to the HIC-HLRN mission. You have a commitment to sharing knowledge of human rights conditions and relevant international processes at the UN level. You are familiar with project proposal formulation and management, and liaising with international donors for project support. You have excellent writing and communication skills (in English and other UN languages), with the ability to impart information to diverse audiences, ranging from social movements to UN institutions. Your communication and coordination skills enable you to work well in collaborative processes, especially among HIC structures, and other international civil society organizations, networks and grassroots groups. You are creative and anticipate and solve problems in a friendly manner. This position is a 40-hour per week, full-time post based at the HLRN offices in Cairo, Egypt. Liaise and coordinate with HIC members and allies and support global and regional member mobilization strategies. Support adequate projects implementation, elaborate the cycle reporting for donors and support monitoring and evaluation. Undertake general training functions, including development of curricula and delivering trainings. Support maintenance of communication tools, mainly HLRN website, contacts database and social media, and provide editorial support for the quarterly newsletter Land Times. Education: Advanced degree in human rights, social science, law or a related field, is preferred; candidates with bachelors-level education and relevant experience will also be considered. Please, submit your C.V. and cover letter to: hic-mena@hic-mena.org and yasser@hlrn.org.